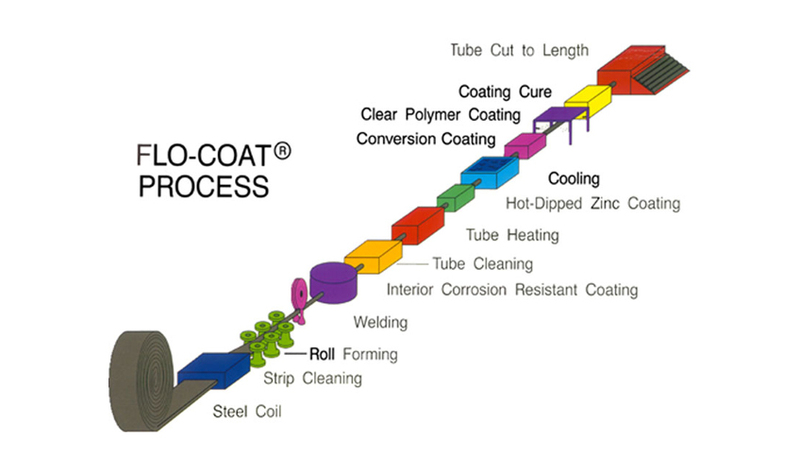 Flo-Coat process is the superior method of galvanizing steel tubing. It begins with flat strip steel, which is then cold-formed and electric-resistance or induction welded. After welding, the tube receives a triple layer of protection-zinc, conversion coating, and a clear polymer top-coat - all applied in-line to assure a uniform coating. The result is a smooth, shiny end product appearance that is unmatched in terms of strength and durability. 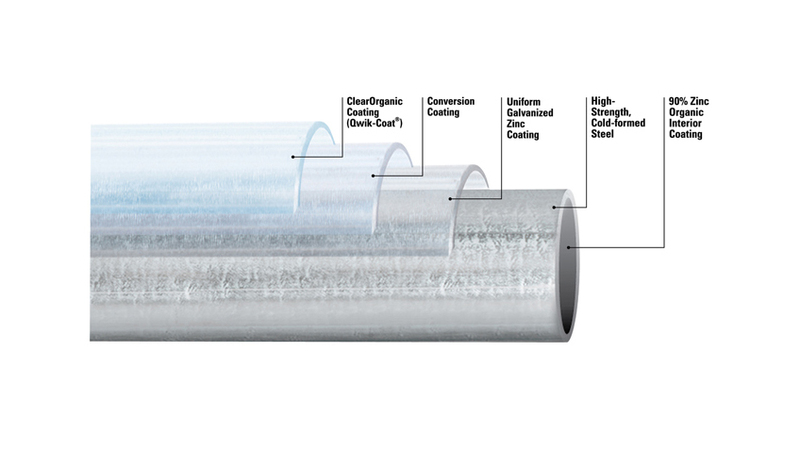 Flo-Coat tubing exhibits greater corrosion resistance because of the synergism created between the coatings; the conversion coating passivates the zinc to slow down the white rust growth process, and the clear top-coat then "seals in" the protection. The triple coat corrosion provided by Allied's in-line manufacturing processes has never been equaled. This triple layer protection (zinc, conversion coating and clear organic polymer) provides a smooth, shiny product appearance that is unmatched in terms of strength and durability. The cold-forming and quenching process creates greater yield and tensile strength than competitive product alternatives. The tube is welded prior to the application of coating; thus, the weld area is as protected from corrosion as the rest of the tube body. The clear third coating also acts as a primer for painting or powder coating. Extensive pre-cleaning is unnecessary, and excellent adhesion is achieved, even at high baking temperatures. Powder coating over Allied's galvanized substrate provides substantial corrosion resistance superiority over powder coating a raw/uncoated substrate. Powder coating over a galvanized surface provides corrosion protection 5-6 times longer than the same over raw or bare surface. Welding Flo-Coat is easily done in the exact same manner as welding bare steel. Allied´s zinc coating contains the lowest lead content achievable (99.9% pure zinc, average 13 ppm), so lead oxide fumes generated during welding are kept to an absolute minimum. 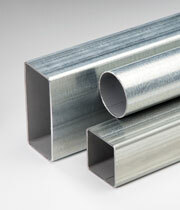 Hot-dip galvanized products usually contain up to .5% lead (5000 ppm). Allied's galvanized products can be easily fabricated...bent, swaged, wall-to-wall flattened...without deformation of the triple layer of protection. Competitive products tend to flake and chip during fabrication. Have a question about Flo-Coat®?